This two-day itinerary in the city of light incorporates plenty of good food, art, sightseeing, shopping and a little exercise. I would happily live these two Paris itineraries over and over again if given the chance. Each incorporates everything I love to experience when I travel: good food, art, sightseeing, shopping and exercise. The Marais, where my family and I typically stay, would be an ideal jumping off point for either of these days. If you’re not staying in the 3rd or 4th arrondissement, don’t fret, they’re still doable. They do take travelers outside the Marais to some of my other favorite spots anyways. Do as many hip young Parisians do and begin your morning at Holybelly (5 Rue Lucien Sampaix, 10th arr. ), an American diner meets French bistro that serves the city’s most satisfying breakfast. While dishes include pancakes with Bourbon butter and maple syrup, I don’t find the breakfast here to be the gut bomb you typically get in America. I always order the exact same thing– two fried eggs with a side of hashbrowns, holy baked beans and toast. At Holybelly, they serve Pain des Amis from the bakery Du Pain et des Idées, the best bread in the world as far as I’m concerned. Travelproper tip: Hollybelly has a smaller location at 9 Rue Lucien Sampaix that serves a more sophisticated menu of breakfast small plates and seasonal lunches paired with natural wine. 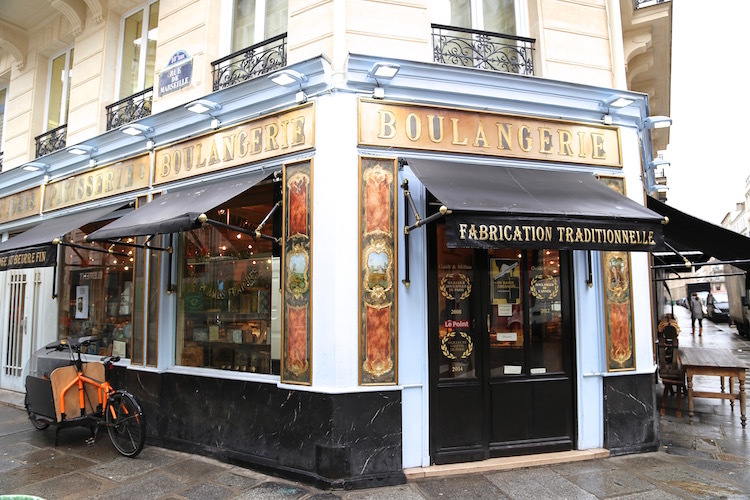 The picture-perfect facade of Du Pain et des Idées. You’re so close, you might as well stop into Du Pain et des Idées (34 Rue Yves Toudic, 10th arr.) for a quarter loaf of Pain des Amis to take back to your hotel room or apartment. If you have a taste for something sweeter, grab a pistachio and chocolate or praline escargot. The bakery is famous for the buttery and flaky snail-shaped pastries. The neighborhood you find yourself in, Canal Saint Martin, has a number of trendy boutiques. My favorites, Centre Commercial (2 Rue de Marseille, 10th arr.) and Centre Commercial Kids (22 Rue Yves Toudic, 10th arr.) are on the same block as Du Pain et des Idées. At Centre Commercial, shop for men’s and women’s basics, on-trend wide legs pants and a wonderful array of monotone sneakers like white Brazil-made Vejas with perforated leather. Around the corner, Centre Commercial Kids is a must stop for those with children or anyone who needs to bring a present back for a little one. They carry the cutest kids clothing brands including Tiny Cottons, Oeuf NYC and Bobo Choses. I love the selection of adorable and affordable backpacks. Walk or take the metro to the Picasso Museum (5 Rue de Thorigny, 3rd arr.) in the Marais. Located in the Hôtel Salé, a Baroque mansion with an elegant staircase and plenty of light, it’s a wonderful place to spend a few hours. A major renovation completed in 2014 added additional gallery space including a vaulted basement and an attic with exposed beams. The museum houses Picasso’s personal collection. In addition to his own sculptures, prints, engravings and finished paintings, visitors can also view the work of artists he admired. Highlights of the collection include Picasso’s portrait of lover Dora Maar with her spindly red fingertips and the Paul Cezanne landscapes on the 4th floor. Walk to the Jewish Quarter’s pedestrian thoroughfare Rue des Rosiers and grab a pita filled with crunchy falafel and marinated eggplant from L’As du Falafel (32 Rue des Rosiers, 4th arr.). Don’t be too put off if there’s a long line. It moves quickly. You’ll notice many people eat as they walk, but if you’d like to eat while seated, tuck into the pleasant Jardin des Rosiers-Joseph-Migneret. The entrance to the somewhat hidden public park is off Rue des Rosiers just past Rue Ferdinand Duval on your left side. If you don’t mind walking a bit further, go all the way to Place des Vosges. Paris’s prettiest public square offers plenty of park benches. Depending on how you feel, you may want to head back to your hotel or apartment for a little rest. If not, continue exploring the Marais. It’s one of the most trendy shopping quartiers in Paris with many boutiques located on Rue des Francs Bourgeois and Rue Vieille du Temple. Some of my favorites include American Vintage (113 Rue Vieille du Temple and 10 Rue des Francs Bourgeois, 3rd and 4th arr.) for European-made soft t-shirts, cozy seaters and high waisted shorts, Saint James (116 Rue Vieille du Temple, 3rd arr.) for souvenirs (their classic Breton-stripe shirt is a wonderful gift for kids and adults), and Carven (Women’s 8 Rue Malher, Men’s 30 Rue de Sévigné 3rd arr.) for the essential French-girl, and boy, look. This wine bar makes waiting for a table at Clamato a breeze. Go put your name in at the seafood restaurant and raw bar Clamato (80 Rue de Charonne, 11th arr.) 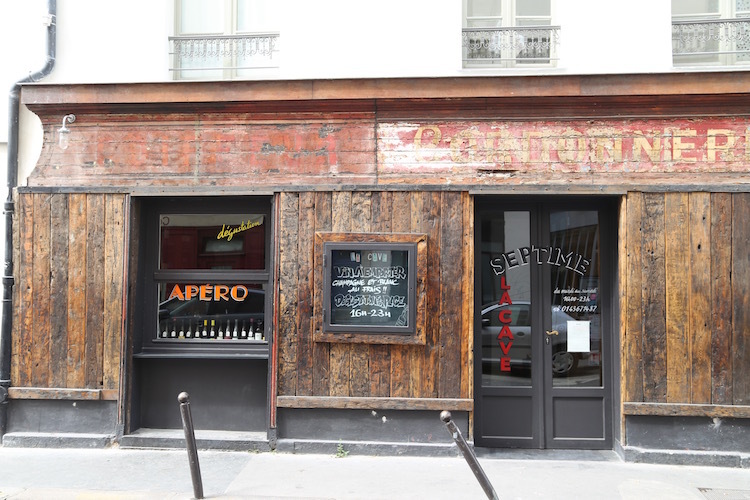 and then head across the street for a drink at Septime La Cave (3 Rue Basfroi, 11 arr.). Owned by the same team, they’ll call you when your table is ready. When you see this gem of a wine bar, you won’t complain about the wait. Located in a former shoe cobbler shop it’s positively charming and it offers one of the best natural wine selections in the city. Pick the bartender’s brain and try something new. The small plates including Jamon Iberico and ricotta with anchovies are excellent should you need to nosh. If you’ve planned far enough in advance, it’s possible you may already have made a reservation at the Michelin star spot Septime (80 Rue de Charonne, 11th arr. ), owned by the same people as Clamato and Septime La Cave. I recommend getting to the area about an hour before your dinner reservation so you can check out the wine bar. It’s that good! This seafood spot is one of the best no reservations restaurants in Paris. Clamato is an excellent restaurant, though and one of the best no-reservations spots in the city. The menu changes constantly, but it always showcases France’s best in-season seafood from plates of briny oysters and ceviches to cooked dishes such as a gourmet take on a filet-o-fish sandwich. Save room for the maple syrup tart for dessert. If you’re not quite ready to turn in, there is an excellent cocktail bar a few blocks away called Cafe Moderne (19 Rue Keller, 11 arr.). Bartenders make drinks using freshly squeezed juices and homemade syrups and tinctures and the vibe is divey in a good way. Blé Sucré (7 Rue Antoine Vollon, 12th arr. ), a humble bakery across the street from a cute park in the 11th arrondissement, makes the gold standard croissant. Their fluffy golden crescents have the perfect flaky outside and chewy inside. All the pastries are excellent and they also serve coffee and have a smattering of outdoor tables, so you can sit and have a quick breakfast. If you’re in the neighborhood on a Sunday, make sure to do a whirl through Marché l’Aligre just three blocks away on Rue d’Aligre. The market is popular with locals due to the fair prices and excellent organic produce. King François the I renovated the Louvre. With croissants and coffee in your belly, it’s a good time to hit the Louvre (Rue de Rivoli, 1rst arr.). Of course, see the famous stuff like the Winged Victory of Samothrace and the Mona Lisa, but also make time for the stunning Napoleon III Apartments in the Decorative Arts wing of the museum. 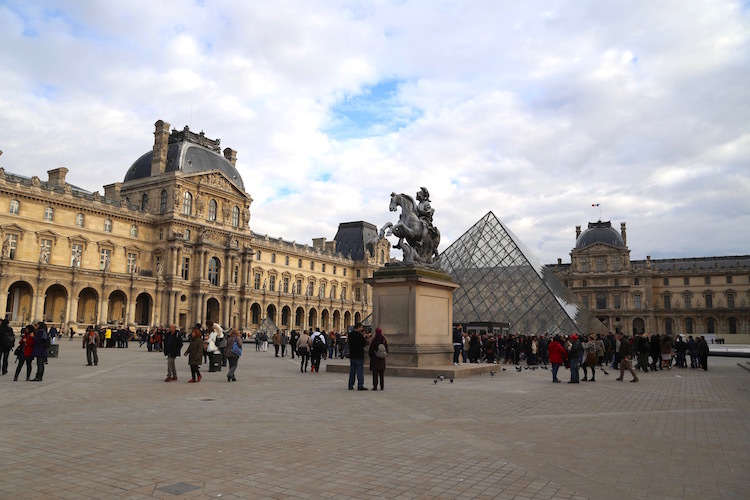 For my husband’s famous two-hour Louvre tour itinerary go here. L’Avant Comptoir du Marché is a great choice for lunch. When you’ve had enough art, head across the Pont des Arts and down Rue de Seine until you get to Marché Saint-Germain. 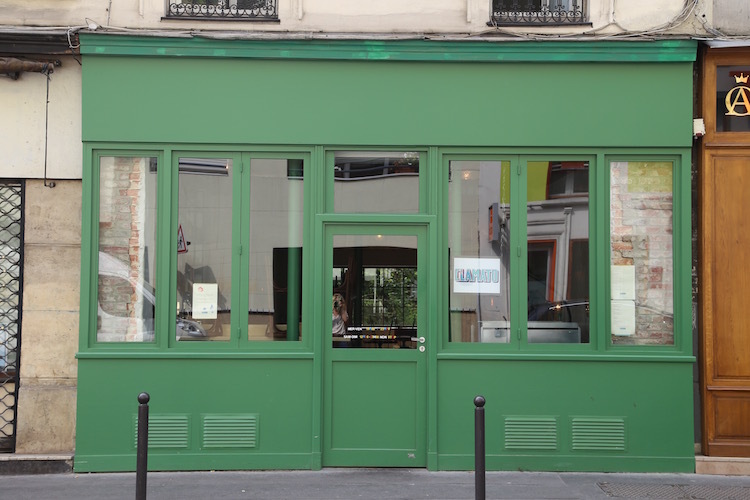 Chef Yves Camdeborde’s excellent small plates restaurant L’Avant Comptoir du Marché (14 Rue Lobineau, 6th arr.) is located in the market. 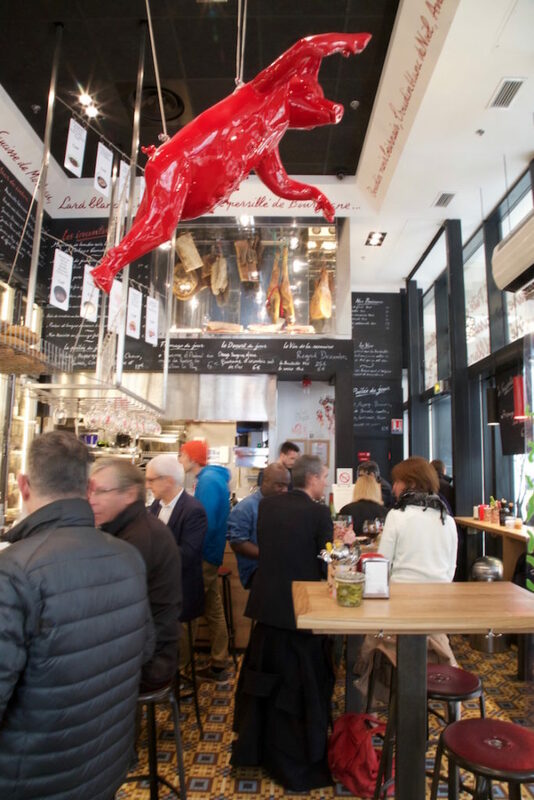 Take a seat at the bar or a high table and dig into excellent charcuterie and small bites like a waffle topped with ham and a blood sausage macaron. Camdeborde’s original L’Avant Comptoir is just two blocks away, but it’s standing room only. If you aren’t too tuckered out, continue walking to the Île de La Cité and take a moment to appreciate Place Dauphine, a tranquil square on the tip of the island built in the 17th century by King Henry the IV. 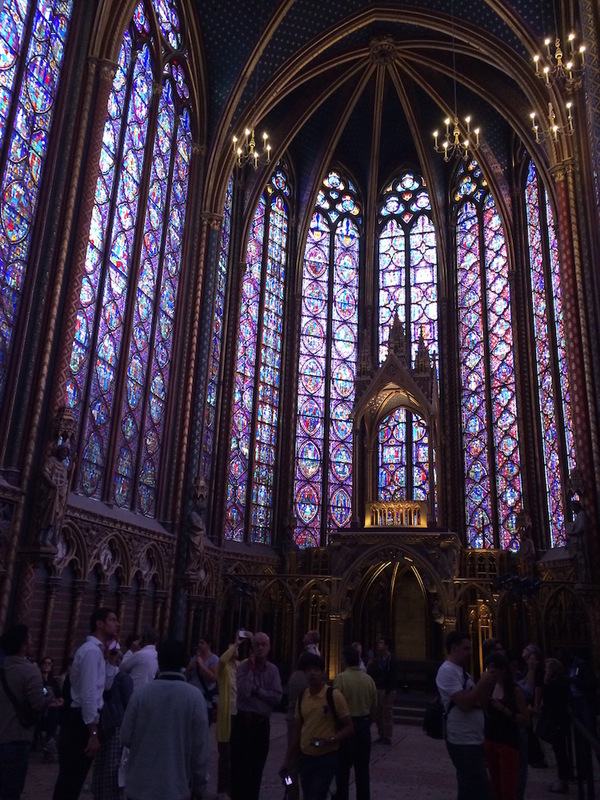 Sainte-Chapelle was built in the 13th century. From here, it’s a very short walk to Sainte-Chappelle (8 Boulevard du Palais, 1rst arr. ), a jewel-box of a church built to house Christ’s crown of thorns. The Gothic church was built in the 1200s. It’s a miracle it survived Paris’s numerous revolutions and city sieges. The iconic Les Vins des Pyrénées (25 Rue Beautrellis, 4th arr.) restaurant in the Marais has been around since the early 1900s. It reopened under new ownership in 2017. The classic bistro ambiance has been maintained, it has a beautiful tile floor and wine bottles line the walls, but the new menu features dishes such as lamb croquettes and a Croque-Monsieur sandwich with truffle gouda. Plan to enjoy the restaurant’s cozy cocktail bar on the second floor, accessible by a spiral staircase, before or after dinner. In the Upper Marais, the Mexican restaurant Candelaria (52 Rue de Saintonge, 3rd arr.) conceals a chic speakeasy. The mescal and tequila-based cocktails are some of Paris’s best. I like the Guepe Verde. It’s a good idea to make reservations through the website ahead of time. Wondering where to stay in Paris? Go here. And here’s more on where to eat and what to see.